It looks as though Synthesizer pioneer, Alan R. Pearlman, "crossed-over" on January 5th 2019. ​My father passed away today after a long illness. At 93, too weak to speak he still managed to play the piano this morning, later passing away peacefully in the afternoon. He was a great man and contributed much to the world of music you all know today. Hopefully I can find something more eloquent to say, but I am too sad for words right now. Of all the Synthesizers, up to about the 1980s, the original "minimoog Model D" was the most popular. 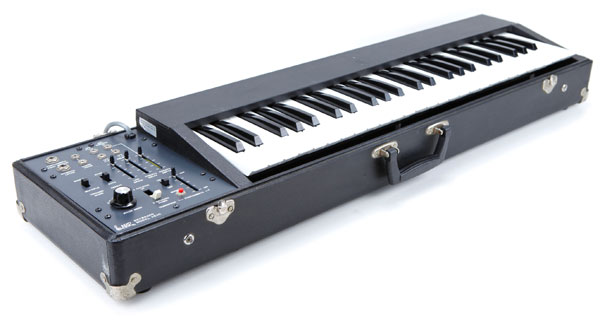 Although I'm a "Drummer", while I was still in High School, I bought a very basic "Korg" Synthesizer. (I don't remember its name.) 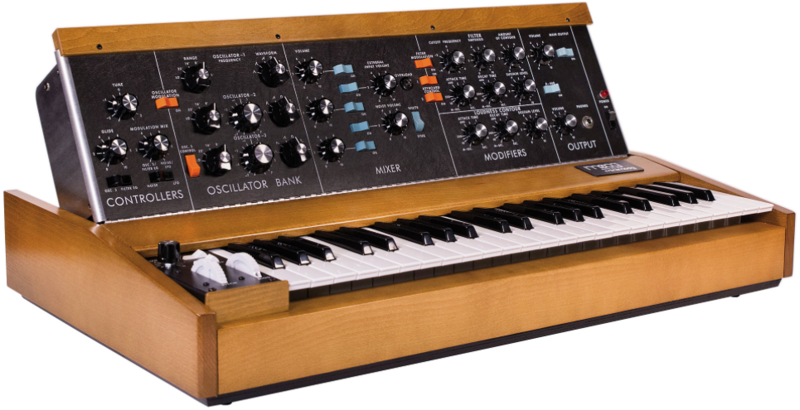 Hearing more and more about this "minimoog" thing, in the early '70s, I saved-up and bought one from a local Music Store ($1,495). The sounds were rich and the various combinations of sonic textures were easy to pull out of it. It was an amazing experience. Although ARP released several different Synthesizers over the years, my ARP 2600 could not only imitate most of their sounds but also added a bit more… that is, until I heard about the "ARP 2500"! In its day, I really wanted an ARP 2500 but Sylvia and I could never afford one. It was a big powerhouse of its time. 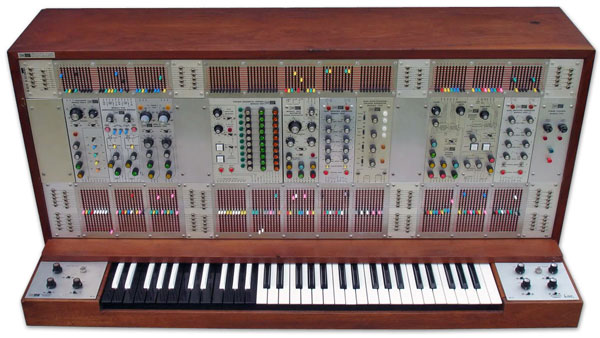 ​Probably the most popular "ARP" Synthesizer was the "Odyssey". My notes here don't do enough to explain the impact Mr. Pearlman and his instruments have had on me, Sylvia and this entire world. Thank you Mr. Pearlman! These are "blank" Patch Charts. Each contains a clear, uncolored image of one Eurorack Module. Each can be printed or used on-screen. Most Eurorack Modules and LOTS of Synthesizers do not have "Presets" (memory recall), where you can Save a "Patch" and instantly bring it back at a later date. A "Patch Chart" is an "old school" way of remembering a configuration of Knobs, Sliders, Patch Cords and Switches, in order to recall a Sound at a later date. There's no real "right or wrong" way to use these. I first learned about "Patch Charts" during some private Synthesizer lessons at a University in the '70s and from the Patch Charts that came with our ARP 2600 Synthesizer from the mid '80s. Keep in mind that our approach to "creating Sounds" with Synthesizers may be different from yours. When my wife and I were first learning about "Synthesizers", decades ago, the goal of any Patch was the final Sound. We've noticed, however, that the current approach to Electronic Music is that the "journey" of modifying the Sound is the goal. In other words, our approach is to create the exact Sound that's in our mind. Whether it's recreating the Sound of a Violin or an abstract, more-electronic Sound. We will modify any parameter we need in order to achieve that final Sound. The approach, these days, is that a Synthesist will integrate the modifications into the "Music". They are not searching for a "final Sound" as we are doing. For the "old school" Synthesists: Adjust all of the Eurorack Modules involved with your final Sound. 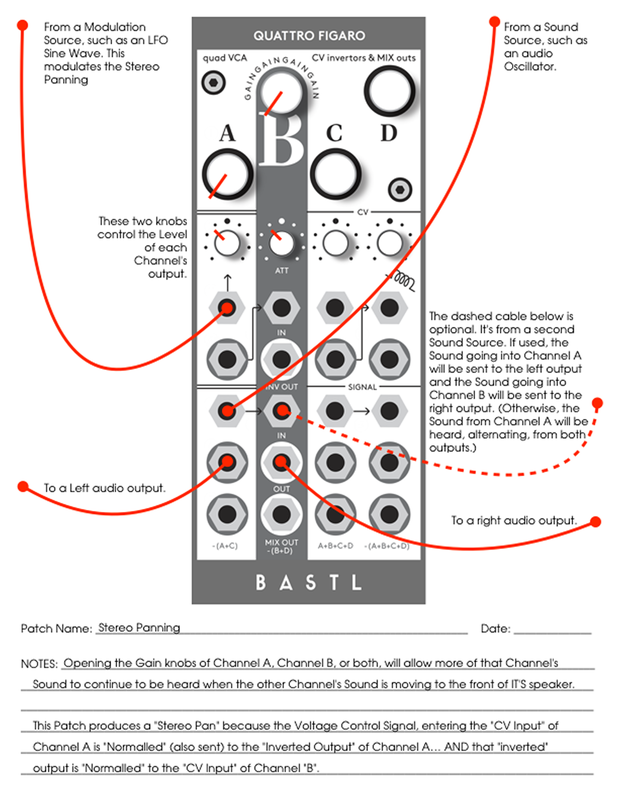 For the "new school" Synthesists: Adjust all of the Eurorack Modules involved with your "foundation" (or "starting") Sound. Then, no matter which approach you start with, select a Patch Chart that's included with the flow of your Sound. 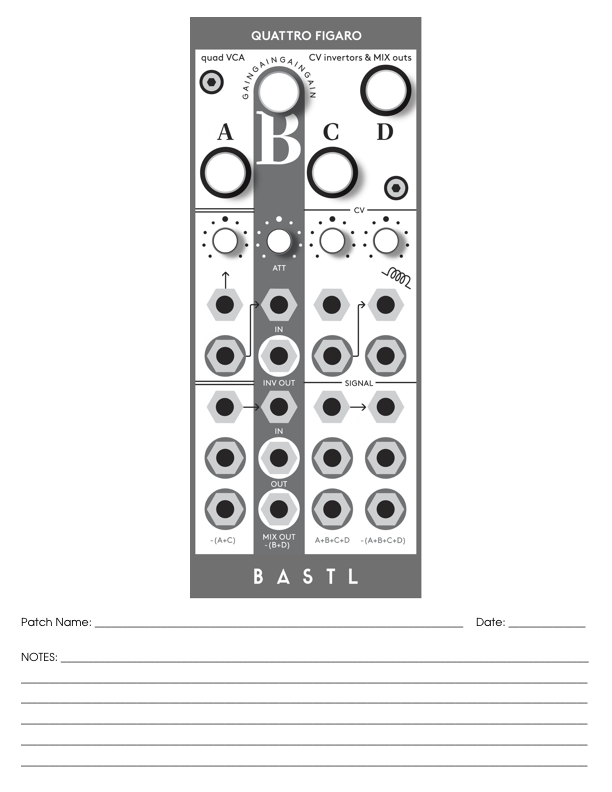 Here, I'm showing the Bastl "Quattro Figaro" quad VCA as an example. Use an easy-to-read, colored Pen, Pencil or Marker. We use a Red Pen because it's very easy to see lines and notes against the gray and black design on most of these Patch Charts. We marked-up the following Patch Chart in the computer. If we had printed this, all of our notes would also be in Red Pen. When drawing your lines, be sure to make them easy to understand. If someone else uses your Patch Charts, or if you look at them in the future, will all of the markings make sense? If lines, representing your cables, need to cross each other, either keep them at right-angles or draw an "arc" (a "hump") where they meet. Recently, I saw 2 videos of an excellent Drummer. His name is "Aric Improta". Not only is he an accomplished Drummer but I've never seen anyone use more of an acoustic Drumset to produce sound. The following web page, contains an article and 2 videos. The first video shows his showmanship. The most outstanding part is when he "back-flips" from one Drumset to another! The second video shows him using every part of his Drum setup for various sounds. In June, Sylvia and I traded-in our "Roland System-1m" ($600) for the "Behringer Neutron" ($300). It finally arrived last week. The System-1m is a nice-sounding Synth. It also has several Patch Points. However, most of the time when I wanted to create a certain sound or Patch our Eurorack Modular into it, the System-1m just didn't offer the flexibility we needed. The Neutron, on the other hand, has 56 Patch Points, which allow for many combinations of Control Voltage signal flow and audio modification. The digital Oscillators in the System-1m made them very stable and tracked across the keyboard very well. We were pleasantly surprised to find the Neutron's analog Oscillators are also very stable. Because I learned Synthesizers the "old school" way, with "Patch Charts", I wanted to be sure there was one available. The User's Manual does have a handy Patch Chart on page 27 but I fine-tuned it just a bit for our purposes. I have included it below for anyone to Download. A "Patch Chart" is used with Synthesizers which don't offer a "Save" or "Store" for your sound creations. I realize that some Artists simply want the "journey" to be the "sound". That's fine but there may still be times when you'll want to start with a certain "sound foundation" and, without being able to Save a Patch electronically, a "Patch Chart" will come in very handy. When drawing lines where your Patch Cables are to be connected, be sure to use a contrasting ink color. Since the Blank Patch Chart I made has "black" lines, I always use a "red" pen to draw the Cable lines. Explain as much as you can and be clear as to "what goes where". Remember, someone else may need to "interpret" your notes or YOU may be wanting to recreate that Patch in the future. You might know exactly how all the knobs, buttons and cables are set but after working with hundreds of Patches and several other Synths, you're going to want a simple layout and instructions on every Patch Chart. Be consistent. 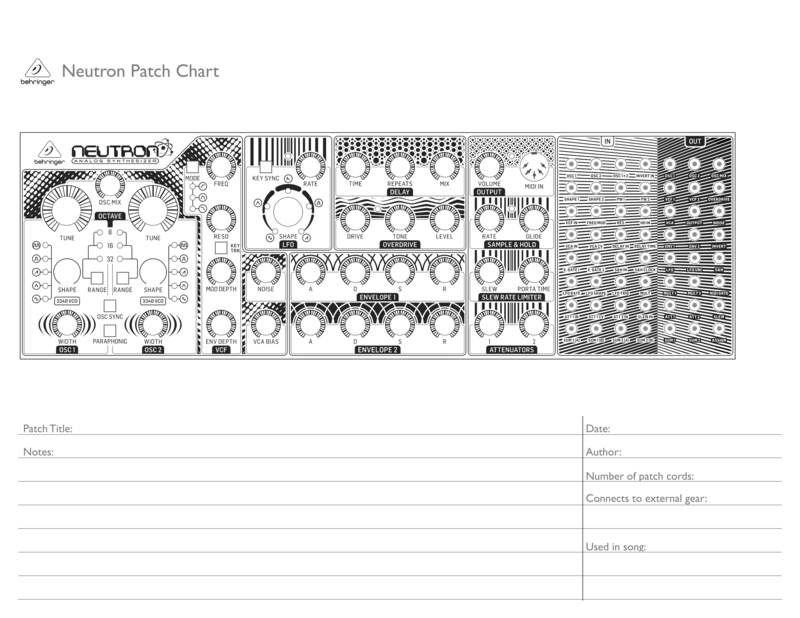 Although you may only be dealing with 1 or 2 Patch Cables in the beginning, your Neutron may later become part of a larger system, maybe a Eurorack Modular. So, even though it's easy to draw a straight line from the "LFO Out" to the "OSC1 In", once you start dealing with 10, 20, 50 or more Patch Cables, you'll end-up with random lines on your Patch Chart if you don't think-through "where" those lines are going to be drawn. I've also included a Patch Chart example (below). At this point, Sylvia and I have only spent a few hours with the Neutron. So, although this "example Patch" is nothing special, it will give you an idea of one way to write-out a Patch. Here's another Plexiglass item that Sylvia and I created a few months ago. This "Drumstick Painting Box" started out as an Earring Display. A company was throwing it out, so we told them we could make something out of it. If you cut Plexiglass / Acrylic too fast, it will melt. Even if you use a "Scoring Tool" to hand-score (etch) into a sheet, in order to "cut" it, dragging the Scoring Tool too quickly across its surface will cause the plastic shavings to become very hot and actually "stick" or "bond" to the metal part of that Tool. Sawing or Drilling into Plexiglass too slowly will cause it to crack, splinter and shatter. If you're using a standard Drill Bit, you really do need to start with a very narrow diameter Bit and work your way up to the size you ultimately need. I've found that the best Drill Bits are not the standard "spiral" type. Instead, use the "flattened-V" shaped Bits. Using "Acetone", you can actually "bond" 2 pieces of Plexiglass together. This is how I added the back edge to the UltraNova's dust cover. Acetone will also "un-bond" 2 pieces of Plexiglass from each other. However, this is not a perfect science. In my experience, one or both pieces may simply break in the process.